« What Are Political Relationships Really Worth? 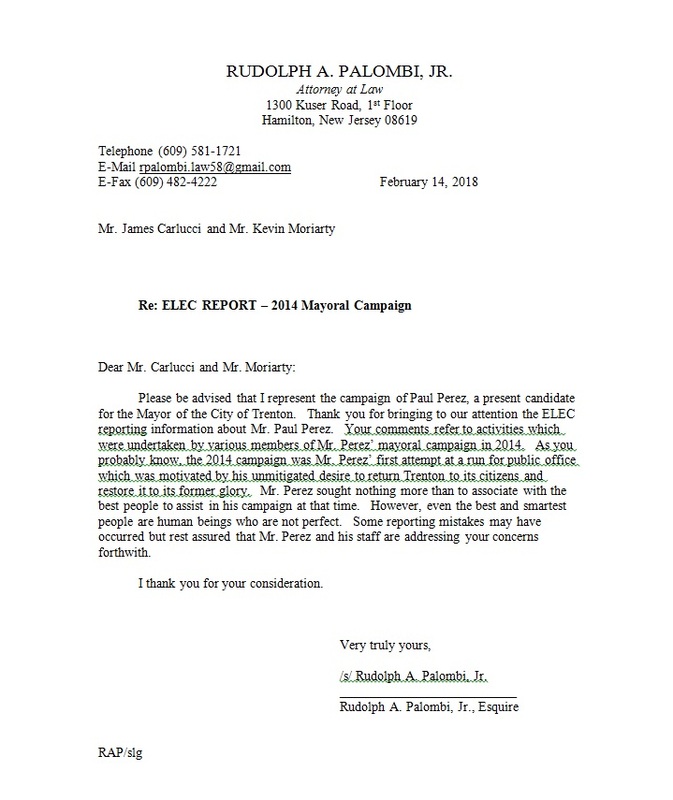 On Monday, I posted a piece looking into the NJ Election Law Enforcement Commission (ELEC) finance reports filed by Paul Perez on behalf of his 2014 campaign for Trenton Mayor, which he didn’t win. He is running for Mayor again this year, and is considered a front-runner after Eric Jackson announced he would not run for re-election. As the apparent front-runner, it’s appropriate I think to look more closely at Mr. Perez’s first campaign. In my last piece I discussed several apparent errors in his filed reports, ranging from a large un-reconciled Cash withdrawal from his campaign bank account, to incomplete donor information to reports signed as Treasurer and submitted by a person not registered with ELEC as the campaign Treasurer. The items I discussed on Monday were several, and created for me the impression that at the very least Mr. Perez’s 2014 financial reporting was sloppy. Mr. Pererz called me yesterday to admit several mistakes in 2014. This morning I was emailed by his attorney. More on that, below. I appreciated the call from the candidate, and his frank and open admission that there were several mistakes made in his 2014 reporting. But his explanation that this sloppiness was due to “a novice campaign” was rather unsatisfactory. Mr. Perez ran in 2014 and is running this year on his image as a seasoned and experienced manager in Federal public service in the military and several civilian agencies. The lack of detail and transparency as indicated on his reports doesn’t suit a candidate who offers the sound and professional management of City affairs that has been so lacking over the last four years. Today, I have to say there are more items to report from Paul Perez’s 2014 ELEC reporting. In Monday’s piece, I discussed a June 9, 2014 Bank Withdrawal of $3,000 in cash reported on July 11, 2014 with the notation “Pay Workers June 10th,” the date of that year’s mayoral run-off election. I noted that ELEC rules prohibit paying campaign workers in cash, only by check. There was an another, earlier sizeable withdrawal of cash is recorded in an ELEC report filed May 2, 2014. On Page 8 of that report, there is an entry dated April 23, 2014, for a cash withdrawal of $3,500 with the notation “[Illegible] Contracts (2).” Whatever Contracts these may be, cash payment is prohibited under ELEC rules. As much as the 2014 Perez campaign withdrew and presumably spent a great amount of cash, another curious feature of each of Mr. Perez’s 2014 reports is that the Campaign reported absolutely no contributions received in cash. None. According to ELEC regulations, small campaign contributions under $300 do not need to be itemized and separately reported. But only if those small contributions are made by check. ALL currency contributions need to be itemized by donor, with name, address and the aggregate amount of any other contributions made, by cash or check, by each person to assure that contribution limits are observed. The two samples of ELEC’s report cover sheet and Schedule A are from one of the Perez reports chosen at random. In most of the 2014 reports, the campaign did show a great deal of “Monetary Contributions/Loans of $300 or less.” Is it conceivable that the person who prepared these reports (who, we also know from the Monday article in this space, was NOT the registered campaign Treasurer) lumped all cash contributions in this category? Perhaps. That might serve as an explanation. But again, that would not be a great recommendation for a candidate running on his management savvy. One other curious feature of these reports is a certain, how do I say this, a certain disconnect between public campaign events and their financial aspects. What do I mean by this? Here’s an illustration. On the “Paul Perez for Mayor” page on Facebook, there are several photos from events connected to this year’s campaign as well as 2014’s. Here’s a shot of an ad for an event held at Trenton Social restaurant on May 3, 2014. 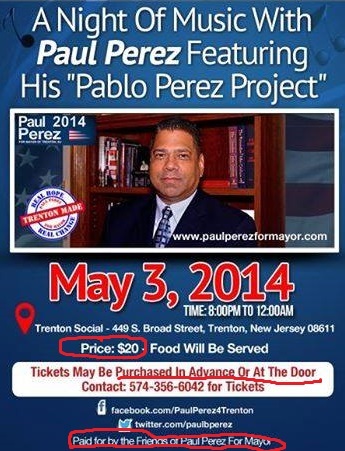 One can see that this is an official campaign event by the notation at the bottom: “Paid for by the Friends of Paul Perez for Mayor.” Admission to the event was a $20 donation, payable “In Advance Or At The Door.” Pretty clear, right? However, in the ELEC reports covering that period, there are no expenses nor income specifically connected to that event. None. A report filed April 15, 2014, reporting all campaign activity in the first three months of 2014, contains no entries that might indicate they were pre-event expenses such as deposits or pre-payments. The same is true of the next two reports filed after the Trenton Social Event, on May 2 and June 10. There are no expenses listed for this event. Not even a room rental charge for the restaurant, or any record of an in-kind contribution from the restaurant, if the restaurant didn’t charge anything for the event. There is a $203.71 debit card charge on 5/6/14 with a note that this was for a “Business Meeting,” which seems not connected to the May 3 “Night of Music. There are no obvious expenses, and even stranger, no obvious income. With a posted $20 donation price, wouldn’t you expect to see several donations of $20, cash and check, from that event? There are none. Is it possible that all donations for the event were lumped into the category of Monetary Contributions/Loans of $300 or less? Possible. But, since there were no disclosed obvious expenses for this event, I really have to wonder what income was disclosed. Surely donations were received, probably a lot in cash. From whom? How much? We don’t know. We do know that $3,411.03 in non-itemized donations were listed on that report. Another earlier event has a little more transparent information on the expense side. The report filed on January 15, 2014 references several expenses seemingly associated with an event at the Masonic Temple. 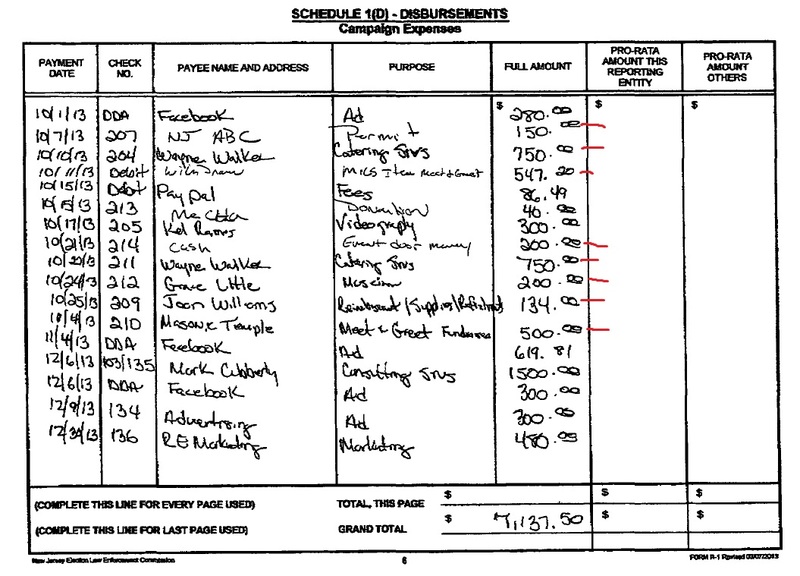 Page 6 of the report lists a $500 payment on 11/4/2013 to the Masonic Temple for a “Meet & Greet fundraiser.” There are some other expenses you can see, for items such as catering, a musician, an ABC alcohol sales permit, and a $547 “Miscellaneous item Meet and Greet” debit card expense, among others. What there doesn’t seem to be is any donations received from that event. 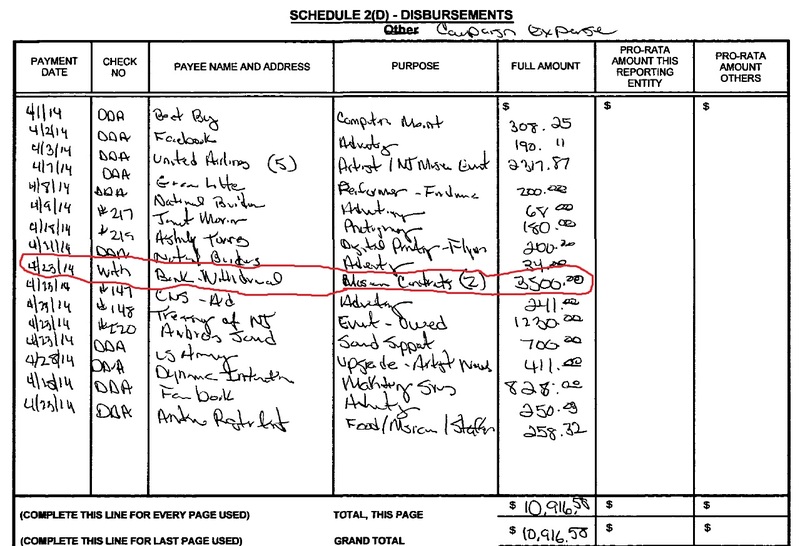 On that same ELEC report covering the last three months of 2013, only $700 of itemized donations are disclosed. But there are $11,377.54 in non-itemized donations during that time. Can we assume that whatever donations were received from that Masonic Temple event are included here? Perhaps. Perhaps not. I think you get the picture. What’s troubling about these reports is that, with so much money reported in the non-itemized category, there is absolutely no way to tell who made the donations and if they are legal. Were they made by people doing business with the City? We don’t know. Were donations made in excess of the contribution limits? We don’t know. Are the non-itemized amounts listed on the front pages of each report even the accurate totals? We don’t know. Could the real amounts be even higher? We don’t know! After four years of Eric Jackson as mayor, three of them served without his filing a single ELEC report, I’d hope that the candidates running to succeed the outgoing mayor would give the voters reason that they would do better. Be more conscientious. Be more buttoned-up. Be more professional. Based at least on his 2014 campaign finance disclosures, it looks like Paul Perez falls short of those hopes. I wrote above that the candidate called me yesterday to acknowledge his faulty 2014 ELEC reporting. I also mentioned that his lawyer this morning sent a letter to me. Here it is, as emailed to Jim Carlucci and me this morning. A little florid, I’d say. The candidate is clearly making a good-faith effort to acknowledge the shortcomings of his campaign, and that is worth something. It is far more than the outgoing mayor has done in the last four years. The closest he ever came was blaming his 3-year lapse filing ELEC reports from his 2010 campaign on being distracted. For three years. “My mind was other places losing. You’re despondent,” you may remember him saying. Perez is going further than that. But the implicit attempt to shift some blame for the 2014 “mistakes” with his reporting on his campaign workers is really kind of small, don’t you thinlk. He was the candidate. And his name and signature are on each and every one of his 2014 ELEC reports. He is responsible for his people and his campaign’s successes and shortfalls, for better or for worse. With 2018’s municipal election season well under way, if not yet in full bloom, will Paul Perez show his more professional side with his campaigning and reporting, now that he is no longer a “novice” and the presumed front-runner? Are there still any other land mines from his first campaign that may yet explode before May 8? Hidden expenses and or donations never disclosed? Will there be any new mistakes or problems to derail his run this time? I guess we’ll all find out together, won’t we?